Automate your lighting experience with Philips Hue and control your lights from home or away. Create light schedules from the Philips Hue App and never come home to a dark house. 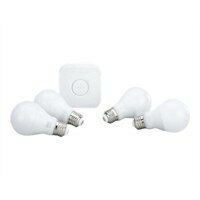 Philips Hue White A19 LED Starter Kit (pack of 4)Automate your lighting experience with Philips Hue and control your lights from home or away. Create light schedules from the Philips Hue App and never come home to a dark house.